When your key is lost or damaged, you can’t open the lock it belonged to! You could lose access to your own home or vehicle, which will put more than a slight crimp in your plans. Our trained locksmiths will arrive at your home, car or place of work, replacing your locks or re-keying your doors to get you access to your home once again. If you have many locks you need to open – say, you’re a property manager or in charge of multiple locations – a master key could be just the thing you need to save yourself from a keyring clogged with dozens of redundant keys. A master key is a key that’s designed to open a wide variety of locks – each lock has a unique key for a tenant or other resident, and then the one master key owned by the landlord. Master keying your properties can save you time and aggravation. If you’re concerned about security – or are just moving into a new home and want to replace the existing door security – a trained locksmith like The GTA Lockman can install newer and stronger door hardware, including deadbolt locks. 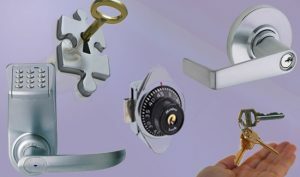 Whether you’re looking to upgrade your existing security or are concerned someone might have access to your own locks, new locking hardware can be the answer to your woes. Sometimes it’s not the key that’s the issue – it’s a damaged lock itself. Sometimes, simple wear and tear can harm the lock mechanism. Other times, they can get jammed or stuck, or have a key break inside the tumbler. When this happens, a trained locksmith can come, repair your lock in no time at all, and have everything working smoothly once again.